Mulkear LIFE’s sign at Annacotty lists a number of achievements which this organisation was supposed to have made. 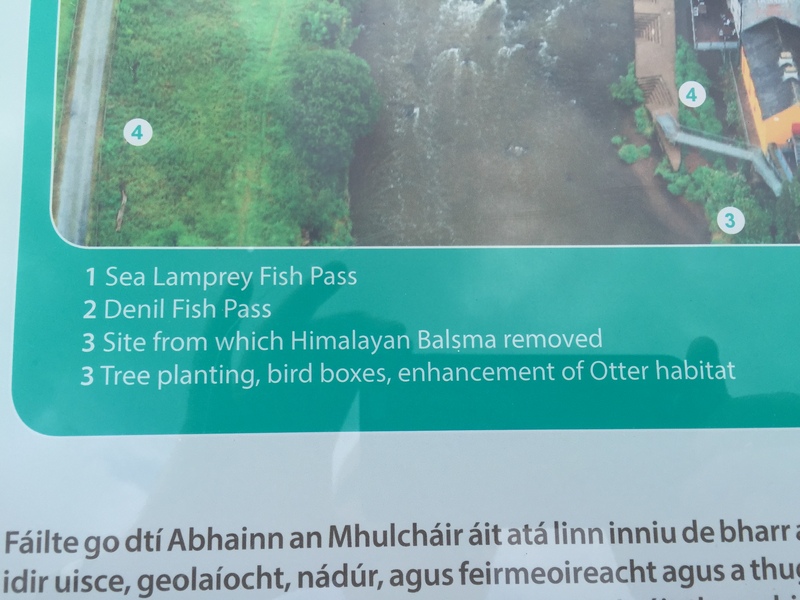 In particular claims are made about the effectiveness of lamprey passes which this organisation installed as part of a €1.75 million EU funded project. However, there are no lamprey passes here today – they were washed away long ago. The claims made by Mulkear LIFE about the effectiveness of these passes are just that – claims. No scientific evidence that these passes worked was ever produced by Mulkear LIFE, and there are no passes here today so clearly there has been no benefit to lampreys. 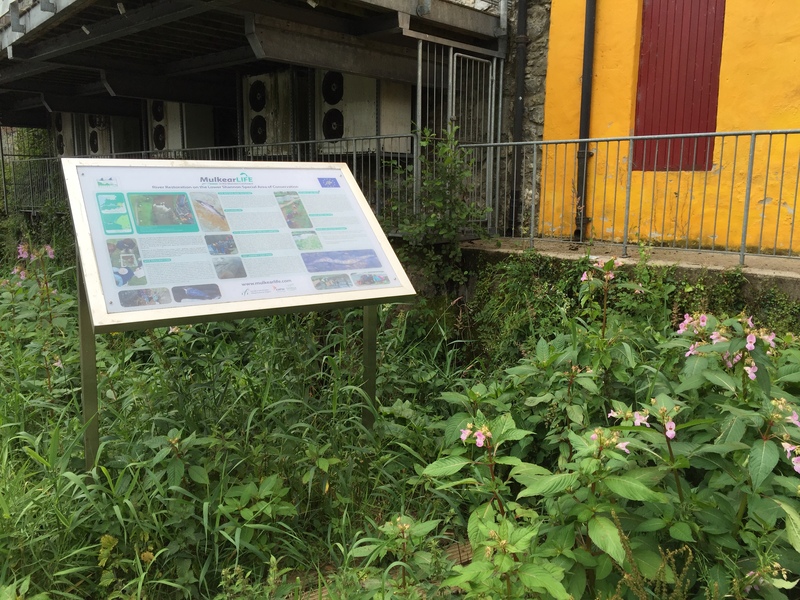 Another claim on the sign is that the non-native plant Himalayan balsam (Impatiens glandulifera) was removed from the site. This plant is of course abundant at this site, and today large stands of it can be seen growing around the sign that makes these ridiculous claims. See some photos below. 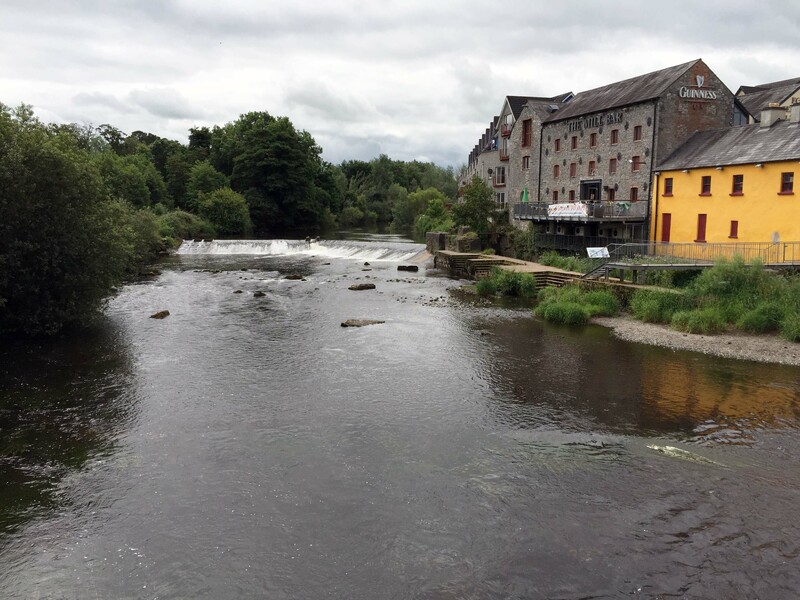 The River Mulkear at Annacotty, Co Limerick, on the 12th July 2015. Sea lampreys were still spawning here at this time. One of Mulkear LIFE’s signs can be seen on the right near the mill. 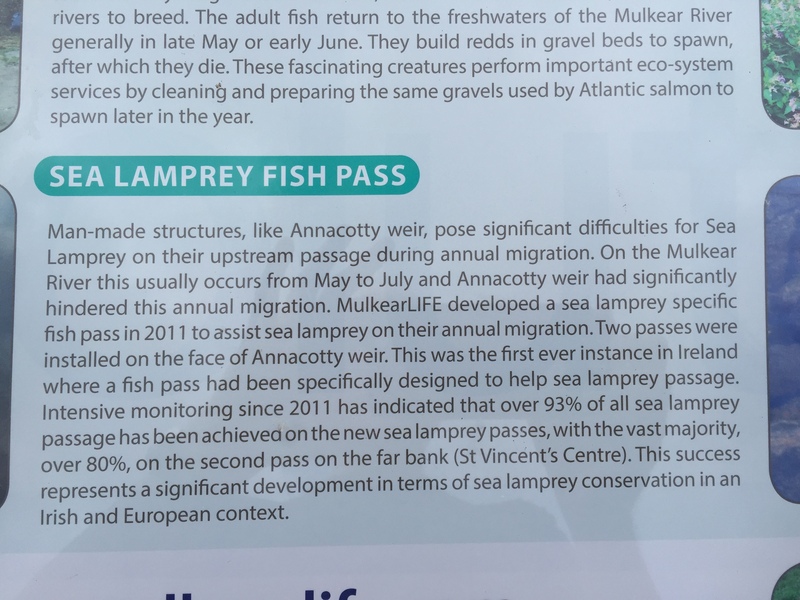 Mulkear LIFE’s sign at Annacotty – the only legacy of a €1.75 million EU funded project? Himalayan balsam is clearly seen growing all around this sign which claims that this plant was removed from this location on the river. But more serious are claims that lamprey passage problems at the nearby weir were solved by this project. The claims made on this sign about the lamprey passes were never supported by scientific evidence. However, there are currently no lamprey passes on Annacotty weir. They were washed away last year. There is no sea lamprey pass on the weir today, and the site is overgrown with Himalayan balsam. There was always a Denil pass on this weir. A few trees were planted, but we could not find any bird boxes. 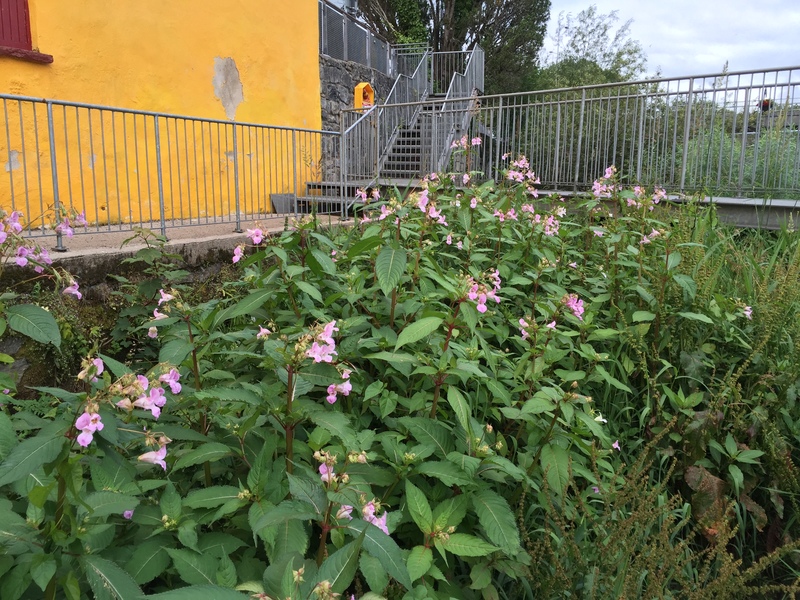 Himalayan balsam growing at Annacotty beside Mulkear LIFE’s sign which misleadingly claims that this plant was removed from the site. The most significant issue that we want to raise however is that in June-July 2013 Mulkear LIFE undertook a “month of major instream works” during the sea lamprey spawning season. These works included major instream development works in areas where lampreys were spawning, or had recently spawned. The works also included the removal of a major weir on the lower River Mulkear (Ballyclough Weir) and the release of significant volumes of silt and suspended solids onto the main lamprey spawning area at Annacotty and below. All these works took place at a time of low water levels and high water temperatures and are likely to have severely impacted on lamprey spawning success that year. The Sea lamprey spawning season extends into July each year and at the time of writing the current post (12th July 2015) Sea lampreys were still spawning in the river at Annacotty. The video below is of Sea lampreys spawning at Annacotty during late-June 2015. The level of siltation in the river is very high and is of real concern. Much of this silt may have come from behind Ballyclough weir – which was removed by Mulkear LIFE at the peak of the Sea lamprey spawning season in 2013. What is clear is that Mulkear LIFE also brought no obvious imporvements to water quality in the lower River Mulkear where lampreys are confined – as they they have been since this weir was built in the 1990’s – despite a €1.75 million EU funded project which had a key aim of restoring Sea lampreys in the Lower River Shannon SAC. MulkearLIFE’s ‘lamprey pass’ – where is the evidence that it works? Mulkear LIFE took a range of short-cuts that damaged their reputation and the Lower River Shannon SAC. The benefits for lampreys and other species that were promised and paid for by the EU were not delivered by this organisation, but the €1.75 million of funding is now long gone – apparently benefiting only those individuals directly involved in this project.